When you lose JJ [Redick], you try to find other ways to score and we sure found ways to score in him. He just came out and caught it and shot it. One of the things that Coach Jim O’Brien spotted, I think in the first, for me it was like the first minute that we brought him into a gym and worked him out, was his ability to get a shot off quick. There is no dip, he’s not trying to get hand position on the ball. He can receive a ball and shoot a ball at the level that he catches it. He doesn’t have to bring it down or bring it over, or whatever. It really was one of the attractions when we watched him workout and it was Coach O’Brien that was on it first and you saw it at its best tonight, where he could catch and get shots off quick. The wiggle room in our league is so small, the ability to do that ends up really being an incredible advantage as you move forward in your career; can you get shots off against elite NBA athletes, and tonight he did. I would say, no. It just felt like any other game. I came out and was shooting the ball and these guys just keep telling me to keep shooting and just let the game come to me. It just turned into what it turned into. I knew that coming in this was a team looking to take that next step. And I just—from the beginning, I’ve said it, I just wanted to find my role as quickly as possible and buy into it, whatever it may be, and just try to be solid and knock down open looks. As a rookie, they’re hard on me. From the coaches to my teammates, everyone expects something of me and I love having that sense of responsibility to try to be better, be my best every night. But it’s just been—I landed in a great situation, I couldn’t have been in a better spot. So, I guess that’s all good. My priority is to get to playoffs and have a shot at a championship. If I’m playing at that level and were able to do that then, I think I should. I’m always impressed with how mature Simmons is. A lot of his responses to the media seem manufactured, but regardless, he always says the right things. It was great tonight. He was hot. He more than replaced JJ [Redick], he hit about eight threes, so it was great for us. He needs to keep on doing it. 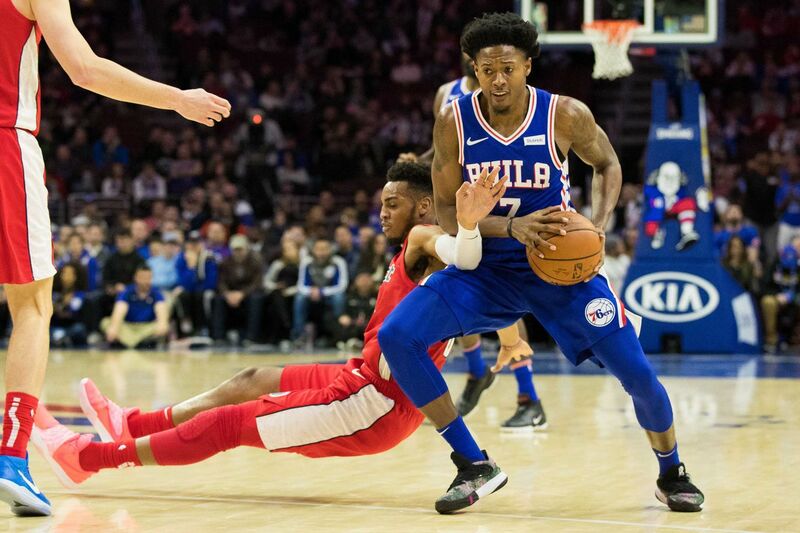 I told him, I was like, ‘You are going to be here for a while, so we need to start mastering that two-man game.’ Because with JJ he seems like he is unstoppable, so I told him we need to start figuring that out. “He more than replaced JJ.” — If Jo keeps this sort of talk up, the Sixers might have a trade candidate on their hands. In all seriousness, the Sixers have overpaid JJ Redick the last two seasons so that they can ensure there is at least one legitimate pure shooter on the roster. If Shamet can continue to grow and develop over the remainder of the season, it could either enable the Sixers to allow Redick to walk in free agency, or if Redick really wants to remain in Philly, he might have to take a discount. In both cases, Shamet may indirectly offer the Sixers financial flexibility. It doesn’t necessarily come with practice. I don’t remember ever going on the court with JJ, we just talk, and we figure it out on the fly. Sometimes he is going to set screens for me, sometimes he is going to be wide open and you step up and you find each other and screen so it is just about communication. Next Post Are players thinking about outside factors as Flyers sink near bottom of NHL?